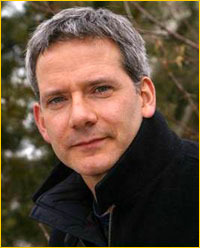 Off The Map, Campbell Scott's quirky back-to-the-land drama about a bohemian family living off-the-grid in the sagebrush plains outside Taos, New Mexico, appropriately scooped up the top prize at the Taos Talking Picture Festival--the five acres of rural land that comprise the Taos Land Grant Award. The movie, which had played as something of a rough cut at the Sundance Film Festival, showed in its final form in Taos, where it was acquired by Manhattan Pictures for distribution. "I got the land! You can visit but it's my land," a gleeful Campbell Scott declared as he accepted a small, stoppered glass bottle filled with New Mexico dirt at the Saturday night awards ceremony. "I guess it just goes to show if you spread enough money around the right community, you get the land," quipped the elated New York actor/director, adding, "Can you think of a better award? You can't give a more lasting award. Some filmmakers will probably sell it, and some will come back." He put himself in the latter category, suggesting the creation of an arts retreat for writers and filmmakers on the rugged land he'd just won. Clearly the audience favorite too, Off the Map is Scott's fourth outing as a director (having begun his career segue with Big Night). Filmed in the Taos area last September on a 30-day shoot with a $5.5 million budget, Off the Map stars Sam Elliott and Joan Allen as an idealistic counter-culture couple who, along with their precocious teenage daughter (played by newcomer Valentina d'Angelis), are visited one climactic summer at their remote Taos farm by an earnest IRS agent. The ninth annual Taos Talking Picture Festival was held April 10-13, 2003 under balmy cornflower-blue skies. Cows and horses grazed at roadside as 5,100 attendees headed north on single-lane Highway 68 alongside a dark-green Rio Grande swelled by spring runoff, then tumbled into the mountain mesa town of Taos, population 5,400. This year's scaled-back festival, which adhered to its mission of focusing on media awareness and thought-provoking filmmaking, counted an estimated 12,000 admissions for 34 programs of 100 films, culled from 1,700 submissions. Other popular features that seem well-positioned for acquisition include Paul Quinn's witty rehab ensemble piece Never Get Outta the Boat, produced by John Cusack; the attractive Canadian/British production Touching Wild Horses, starring Jane Seymour as a woman who lives alone on a remote island populated by wild horses; the gritty gambling drama Stuey with Michael Imperioli; and The Stoneraft, director George Sluizer's Spanish-language magic realist fable about five people drawn together when a crack occurs along the border between Spain and France and the Iberian peninsula begins to separate itself from the mainland, with a standout performance by Portuguese actor (and Bruce Springsteen lookalike) Diogo Infante. Sluizer said he has had U.S. acquisition talks with Sony Classics, Paramount Classics, and Fine Line. On the already-spoken-for list, Newmarket's New Zealand film Whale Rider drew accolades; writer-director Neil LaBute got an enthusiastic response to the sneak preview of his relationship satire The Shape of Things to Come, which USA Films is distributing; and Christopher Guest's folk music mockumentary A Mighty Wind, to be distributed by Warner Bros., amused--although it couldn't hold a drumstick to Rob Reiner's previous rock music mockumentary This is Spinal Tap, partially penned by Guest. LaBute provided some provocative intellect, but the operative word this year was "mellow" as a laid-back Sam Elliott, Emilio Estevez, and Alan Rudolph meandered down Taos' narrow streets between screening venues and art galleries in this still-cowboy town washed with crystalline mountain air and always-changing sunlight.